As shown in the given diagram, use of HHO gas reduces the Carbon monoxide (CO) emission to 27%, Nitric oxide (NO) emission to 28%, Nitrogen dioxide (NO2) emission to 51%, Nitrogen oxides (NOX) emission to 32%. HHO + Air mixtures, mix with the Hydro carbon fuel and ignites, results in complete combustion of the hydrocarbon fuels and lower ignition energy of fuel – resulting. 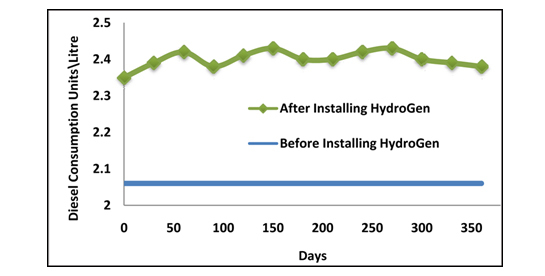 Increased fuel efficiency between 10 to 30% -results, investment on Hydro-Gen can be recouped in less than a year. Reducing emission minimum by 60%. Engine runs smoother and Vehicle life extended as well. Engine heat-up is minimized at 15 to 20%. 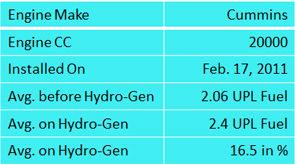 Results of Hydro-Gen will vary depending on application and the Vehicle. Oxy Hydrogen is not a replacement or alternative fuel for your engine or equipment. It is only the fuel supplementary. We do guarantee for the successful reduction of fuel in all industrial and commercial diesel applications. A results in gasoline or diesel motor utilized for non commercial applications like passenger cars, are not guaranteed with our product alone; aftermarket products of ECU, EFIE, and/or MAF may require to achieve definite fuel reduction.